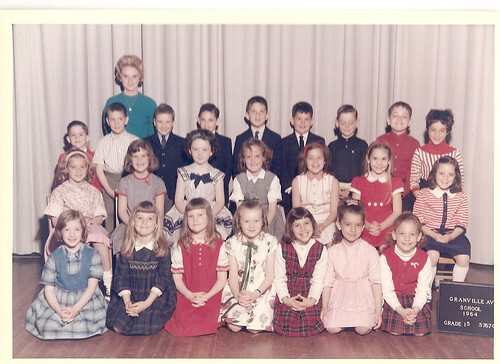 You're looking at my first grade class, circa 1964. (Can you guess which one is me?) I haven't kept in touch with most of my first grade classmates, although I remember all their names. I hadn't thought about my first grade teacher, Mrs. Segal, in over 40 years until this weekend when she friended me on Facebook! Do you remember the line -- "It's not what you know, it's who you know." It means roughly that to get things done you need to build up social capital, not just knowledge. When I first started my work in the nonprofit sector, I worked in the development office and this phrase was often used to describe what was needed to be an effective fundraiser. Social network sites, like Facebook, are making it very easy for us to connect and build relationships with people we know, might want to know, or knew in the past. Social networking site, like Facebook, are making it easier to accumulate and maintain our social capital. Although it takes relationship building and other steps to actualize it. I am thinking about the "Facebook Generation," those who have grown up with social networking sites. They will have the potential to remain "connected" with everyone they have met growing up. Think of it - they will have the opportunity to create a lifetime of social capital. That thought makes me wonder about social networks will continue to change our lives and our work. Will the nonprofit development officer of the future say, "It's not who you know, but whether you're connected with them online." Are you the second from the left, in the middle row? BTW, I love your new blog design. Very clean. Nice job. No! I'm in the front row .. can you guess now? Beth, as a member of the Facebook Generation, I can say with certainty that you're spot on about how useful it is to stay connected with the people you grew up with. I'm probably even a little old, at 27, because Facebook came out when I was in college. Every now and then someone from grade school will friend me out of the blue -- but it would be even better if we were connected online to begin with. It's helped me rebuild a number of relationships that would otherwise have laid fallow. you know as I was writing this, I also said to myself - SO WHAT! What's the value? It's latent value, but do you have a story of how keeping in touch with a grade school friend helped you professionally or even personally? Just curious and thanks so much for your thoughtful response. Care to guess which one is me? Okay, I'll guess: are you in the first row, second from the left? The shape of your face and the straight-across bangs with long hair look very similar. Social network re-connections have been helpful to me in all sorts of subtle ways. I've found fellow honor-student classmates from high school who I never realized were right here in San Francisco, kept in touch with colleagues after they've left for school or other firms, and heard about news in the lives of many people who I care about but don't speak with on a regular basis. My experience is that being connected online means that your life and the lives of others is a bit like a radio station: you're constantly broadcasting to anyone you've ever friended, and they're doing the same back. It's made it far easier than before to find reasons to get in touch, and somewhat paradoxically it's also made real personal connections all the more valuable for their richness. Interesting - I thought for sure the ending was going to read "It's not who you know, but whether you're connected with them OFFLINE." I "know" tons of people online- and have very reciprocal relationships with many but those where the relationship goes off-line are pretty special- rare! Recently, a lot of those random facebook reconnections have been coming in handy. I am helping a friend from high school launch call2action.com and when I posted about our blog on facebook a few people I had lost touch with connected me to some really great programs and sites like demotix.com and Peace Innovation at Stanford. But that is high school not grade school. Though, I think in the next few months I may be reaching out to some grade school friends to help me produce an event in the Middle East... we'll see! In that case, facebook will have helped me maintain a social network from the early 80s until now!